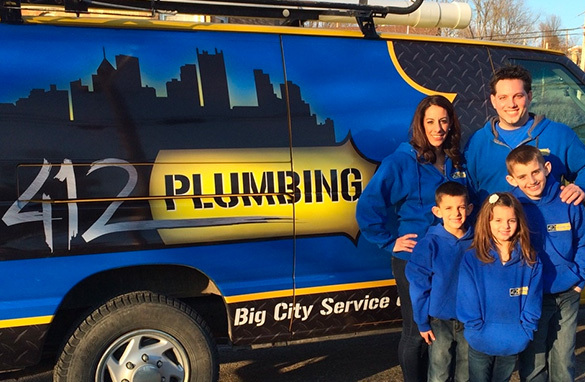 412 Plumbing serves to meet all your plumbing needs. With customer-focused service and our personal guarantee, we genuinely care about our clients, and we are dedicated to offering the highest quality craftsmanship and the most affordable rates in the South Hills. Whether you need a leaking pipe repaired or have a clogged drain, we have the tools and expertise to take care of your plumbing issue. With our routine maintenance services and 24/7 emergency services, we are dedicated to treating your home or business like our own. We also offer video camera sewer line inspection, water heater installation, drain cleaning, and high-pressure water jetting services for our residential and commercial clients in the South Hills. No matter what your plumbing issue is, you can count on 412 Plumbing to take care of it! Call 412 Plumbing today to schedule an appointment for high-quality plumbing services from our licensed and expert plumbers who will get the job done right the first time. Highly recommend 412 Plumbing. Our hot water tank wasn’t working and they were able to send someone out that same day and fixed it in no time! Will definitely be using their services in the future. Very friendly and explained what happened in detail so we can fix the issue ourselves in the future if it were to happen again! I can’t say enough good things about this company. The water in my tub would not shut off. Brett was here within an hour. Very nice young man. Excellent job and reasonable price. Will definitely use him again. I have used and referred 412 Plumbing a number of times. They are always responsive, fairly priced, and dependable. They are definitely a 5 star company!!! Third time we have used Brett’s services and highly recommend him. On time, fair prices, good work – couldn’t ask for more.